... or measure "on the fly" during a feed? The Signature Technologies SA-2000 “SAM” module, and Signature Technologies “SamView™” Software package can be used to perform cyclic measurement of the dimensions of specific features on manufactured parts without a reference thus simplifying die design. The illustrated method can of the machine so the formed component can be verified as having the proper thickness. The system works by probing both sides of a work piece with a spring loaded "telegraph plunger" which presents a target to an Analog Proximity sensor (linear Proximity). The SAM™ module captures the analog information from both, and performs a measurement, which gives the thickness of the selected area of the work piece. The Precision of the measurement is ensured by "decoupling" the measurement from the slide motion (which isn't very accurate). The Linear proximity in the bottom die section provides an indication of the position of the bottom of the work piece that ensures against any lack of flatness in the work piece compromising the measurement. The "Virtual Channel" feature of SamView™ makes the differential measurement possible. 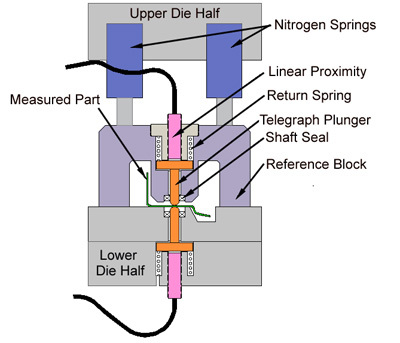 The "Telegraph Plunger" Isolates the linear Prox from material composition variations and magnetic history which could compromise the accuracy of the measurement. The measurement can either be calibrated, or comparative depending on the application. 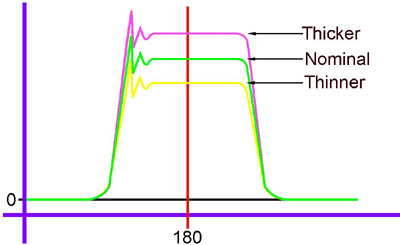 Calibrated measurements will give the divergence from nominal thickness of the incoming material at the testing point, OR direct dimensional information. Signature Technologies can supply a wide variety of solutions to various manufacturing process problems dealing with measurement, verification of properties, tool condition, and machine health.